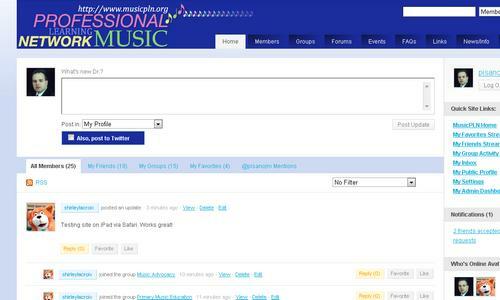 With this post on MusTech.Net I declare the MUSICPLN.ORG site to be officialy in BETA! Let’s hope it’s a smooth ride! Yes, there are some minor bugs and things to iron out, but it’s good… it’s real good. If you are just dying to get a glimpse of the PLN, check out the two introductory videos I posted at my YouTube Channel here. Welcome to the Music Education Professional Learning (MPLN) Network’s Website. On behalf of the entire MPLN Launch Team, I extend to you our warmest regards and high hopes for a successful endeavor with us on our Social Media Experiment for Music Education and Musicians. The germ of the MPLN started years ago when I started to blog about Music, Education, and Technology as part of my personal Website, JPisano.com. With it, I embarked on a journey to bring better, not-for-cost, information about music, education, and technology into/onto the Internet. This quickly expanded into a number of projects starting with the major expansion and migration of my blog content to its own site at MusTech.Net. From there, I started many related online projects and quickly began to find friends and colleagues with similar mind-sets and focus -many of whom are now members of this launch team. While I don’t intend to chronicle the complete time-line of events leading to this PLN, I do intend to tell you my vision for this site and the mission of this PLN. With regard to missions and mission statements, I believe that the most successful missions and visions are those that are relevant, succinct, and not-complicated. My goal with regard to the integration of technology, education, and music has not changed over the years and remains the same today as it has been with the original thought-process behind my initial blog… The mission of the MPLN is to generate better, more accessible, information about music, education, and technology and to freely encourage dialogues from Music Educators through social media outlets. The success of any endeavour is directly related to the effort of the individuals that “catch the vision” or see the value of the endeavour itself. The MPLN’s success will be directly related to the effort of the community that emmerges through the use of the MPLN Website itself. Like anything, the MPLN is now a tool for people to learn, utilize, and profit from. Not unlike a a sword that is never honed or used -those that expect this community to exist without their participation will find themselves with a useless, un-sharpened tool. In order for this community to thrive it must become just that… a community. We are using a fledgling, yet extremely powerful, social network engine to provide the platform for this Website called BuddyPress. The BuddyPress platform is built-upon the rock-solid foundation of the highly successful WordPress engine. I spent a long time looking at the known social-media platforms that were available to us at the start of this project, Ning, GoSocial, Grou.ps, Spruz, etc. All of them are good platforms, but none of them provide the functionality and future functionality that the BuddyPress Engine provides. That being stated, the BuddyPress engine requires a number of things to be coded and implemented in order to work properly, not to mention its privately owned server to operate. Because BuddyPress is just emerging from its child-state, so the MPLN will have to deal with the growing-pains of the platform. Rest assured, there will be some bumps along the way, but we are committed to making this work and this community thrive. But, of all the platforms available, again, it currently offers us the best hope at making a seamless, integrated, and highly funcitonal solution for our purposes. The striking truth of the matter is this; our ”Professional Learning Network in Music in this technological age” has been rapidly evolving, especially over the last year. Many of us have been using bits-and-pieces of Web 2.0 technology some-what effectively as an ad-hoc PLN for months now… Twitter, FaceBook, RSS Feeds, Blog Networks, etc. Frankly, I’m surprised that we have not had some type of large-scale Social Media Network for all Music Educators prior to this. Again, here and there, there has been some small attempts. It is my hope that this MPLN will bring together and connect people, regardless of the social media platform that they choose to implement AND to allow more focused and even parallel Professional Learning Networks to exist and thrive. One of the main goals of the MPLN is to provide a meeting place so that we can all find one another out “here” on the Internet; then, once we “find” each other, we move on both in strength and purpose.